When Valley Walls arrived gratis from the publisher, the first thing I noticed was the high quality appearance. The clean cover and 80 lb. matte coated text stock feel smooth to the touch. Flipping through the book you gaze upon beautiful photographs, mostly by Glen Denny himself. Kudos for the production team for deciding to print on a four color press. This adds a richness and depth to the black and white photos depicting Yosemite, Camp 4 and its storied characters. Each chapter is lucky enough to be introduced via an image setting the scene. As for the memoir itself, only the prologue occurs outside the Valley, as you get minimal backstory about the author. In this brief glimpse you see Denny embarking on a simple, yet invigorating scramble that propels Denny into the Valley the following summer. By the first chapter, in September, 1958, Denny arrives in Yosemite Valley having never actually tied into a rope or put on a harness. But his lack of experience does not deter him from becoming a major player in the Golden Age of Yosemite climbing. And for those of us who weren’t there, we’re lucky Denny was. Available at Yosemite Conservancy and Amazon. A masterful storyteller who knows exactly how to keep you hanging, Denny’s short stories hook you instantly and drop you into the daily life of Camp 4; the friendships, deaths and rescues, solo attempts and historic ascents, all culminating with a speed record of the Nose. Some of the 21 carefully crafted stories are a scant 2 pages while others go deeper, covering nearly 20 pages. Occasionally a story has no climbing action to speak of, and alone could be construed as revisiting mundane details of Camp 4 life. But they all work together to effectively provide a vivid picture of the place and an emotional connection to the people. Denny’s prose often gives you the sensation that you’re mingling with Harding, Pratt, Roper, and other prominent climbers of the time. Whether you join them around a campfire, feeling the warm breath of the flames, or find yourself relaxing in a chair at the Yosemite Lodge, you are now privy to the many inside jokes. When you read Denny’s thoughts and conversations, they feel like real-time musings, not reflections of the past. This happens as he climbs with many partners, including Royal Robbins. It’s easy to visualize Robbins tying off long horizontals in super thin cracks and practicing his yodeling. It is very rare to hear reflections of the past from Denny’s future self. One of the very few reflections occurs mid-way through the book when Denny remarks that climbing hammocks had not yet been invited and portaledges were undreamed of. Instead of using this now standard gear, he explains how they used slings that constantly cut off circulation. While the sleeping system frequently put parts of the body to sleep, Denny never seemed to lull his mind to sleep. The lack of creature comforts and equipment is now fabled–and not just when Denny and his companions are training themselves to get by on less. Hauling means carrying loads from your waist as you prussik up a braided rope, sans mechanical ascenders. This is particularly notable when Denny mentions the 4 gallons of water in glass bottles he hauls up to Harding and Pratt in a single push; about 44 pounds, not including the shirts used for padding, and the extra food. In addition to stories of life on the big walls, Denny exposes what Steve Roper, Frank Sacherer, Gary Colliver and others are reading. We become versed in what ordering “bones” from the Yosemite cafeteria really means. And it’s hard not to smirk while reliving classic sand-bagging conversations. 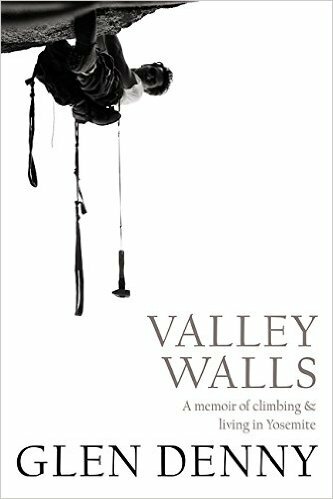 Fortunately, Valley Walls is not written as a longing for the past nor a depressing contrast to the current state of climbing. Instead, it’s a vivid walk through memory lane. For example, when Denny learns of Baldwin’s death, he sets the scene with a 2-page story about where he was, why that place was so special, and includes a happy memory of climbing with Jim. Unlike Alex Honnold’s recent book, Alone on the Wall, there is virtually no gossip or defense of actions. Valley Walls is an unassuming, unapologetic glimpse into the culture and characters of the Valley at that time and maintains an aura of documentary-style honesty rarely found in personal historical accounts. Denny does sprinkle in just a touch of glacial history. Most often during moments on the wall, while describing his surroundings. Reflecting on the spectacular scenery, he imagines the changing landscape, as glaciers slide by and lakes appear, then vanish. The book culminates with a speed ascent of the Nose by Denny, Steve Roper and Layton Kor. This is less than 5 years after Denny arrives in the Valley, having never roped up for a climb. The sheer adventurousness of these early big wall climbers only amplifies when you read about the “cutting edge” gear used on each ascent. I image this book proudly displayed at the Valley Visitor Center (it’s scheduled to appear in all 8 Yosemite stores) and I have to smile. Oh how time has passed. Denny and many of the other characters depicted in the pages of Valley Walls are now legendary figures in the annals of climbing history, a far cry from their days in Camp 4, consistently scoffed and scowled at by park staff. Valley Walls invites you into Camp 4 to overhear stories and conversations of the early climbing legends. Similar to the Valley Uprising film by Sender Films, the well-curated stories never overstay their welcome. If anything, they’ll keep you longing for more details about the Golden Age of Yosemite climbing. Those were the days, and they were good. Denny’s book will delight climbers as the author doesn’t excruciatingly explain every climbing term. If you see “rurp,” “bong bong” or “munge” and don’t know what it means, it’s your job to look it up in the provided climbing dictionary. That said, many concepts are more simply stated which makes them enjoyable for climbers and non-climbers alike. For example, instead of using climbing jargon like “chicken-wing,” Denny instead speaks of putting his arm in the widening crack for leverage. The Yosemite Conservancy did a commendable job with this book. The paper selection showcases the wonderful photos and makes for a pleasurable reading experience. The editing felt top-notch as well. Only twice did I question a repeated phrase, and that was probably because I read the book in two days. In addition to commending Glen Denny on a finely written book, I feel compelled to specifically acknowledge those who I merely alluded to above: Nancy Austin’s design, Donald Prevett’s bequest to the Yosemite Conservancy, and the Jostens printers in Clarksburg, Tennessee. Valley Walls is officially available on May 10th, 2016, though some retailers do offer pre-sales. In the interest of full disclosure: We did receive this book for free from the publisher, with the intention that we would write a review. I did not expect the review to be so glowing, but this book really deserves it. Also, all the Amazon links in this post are affiliate links, which means that WeighMyRack receives a small commission if you buy an item after clicking the link. This helps us continue to create helpful content and improve the quality of the site. Thanks for your support! This is of minor importance, but in 1958 Glenn arrived “never actually tied into a rope or put on a harness” is based on your assumption that climbers used harnesses. Harnesses were not used for the early Yosemite walls and were not used for free climbing until the mid seventies. I bought the book and am now enjoying it. Other than your harness use, your review is pretty good too.